Bright Blue Earth lives up to its cutting-edge appeal in yet another new project, Midas Rat and ME. This father and son collaboration combines the witty talents of Jim Grafsgaard and son, James. Available in a limited hand-bound edition and also 'cheap zine' edition, this urban fairy-tale is as about as punk-rock as you can get. The best way to describe it would be as a hipster picture book or the anti-comic book. The setting is Minnesota and the Grafsgaards' play on the stereo-types of this cold state and make good-natured fun of the 'scene'. It feels like you are part of the pages, because as outlandish as it is, there is truth to it. First Ave, shopping at Goodwill, and gutter-punks all make their way into this hapless love story between Midas Rat his young admirer, who narrates the story. The collage of imagery weaves its way around the simple sentences and ultimately creates a vivid story. 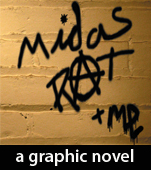 Midas Rat and ME is a fun collaborative work. Author's Note: I have interviewed Bright Blue Earth previously for other publications and have been a guest on one of their podcasts. ← Don’t judge this book by its cover . . . then again . . .
Don't judge this book by its cover . . . then again . . .